How do Electronic ID eartags work? Electronic ID tags are small round tags that are placed in the ear of the animal. EID tags or RFID tags equipped with a unique 15 digit identification number and radio frequency identification. EID tags are designed to last for the lifetime of the animal, though there are now reusable tags available. Why use electronic ID tags? EID information is an important step as the cattle industry develops towards precision ag for cattle management. We are moving to a highly digitized future where instead of once per season, ranchers use data to continuously improve the decisions around individual animals and pasture performance. A reliable method of cattle identification. EID tags are smaller and not easily scraped off on a fence or get lost. Convenience of reading animal numbers. You can use a RFID wand reader to scan the animal tag to identify cattle as they move through the chute. Improve accuracy of tracking animal weights and individual animal performance. By tracking weight gains by individual animals, you can identify which cattle are performing better. Improve cattle record keeping on cull, animal health, mating, and pregnancy decisions. Individual EID tags can add animal health records against to capture information by individual animals. Access to certification programs. Each year, there are more industry programs that require EID animal records for traceability and export requirements. You can capture more value-add per cow for management you're already doing. 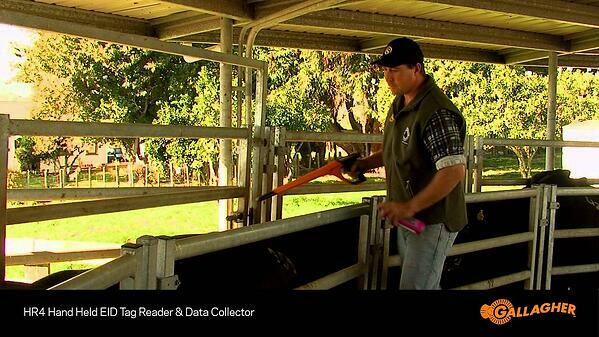 Picture: Gallagher EID tag reader allows reading of eartags as they move through a corral. More smart cattle weighing scales are on the market than ever. An EID smart scale is integrated with the EID tag via bluetooth, and captures the weight of each animal associated with its ID number as it passes over the scale. Even if you don't use EID, smart scales can help you improve animal performance by keeping more accurate and frequent records, to understand which individual animals are performing better in your program during the season. The better known companies are Gallagher and Tru-Test, but Rice Lake Weighing Systems in Minnesota has also developed portable weighing scales that can be moved between pastures. Hayley Strohm at TomKat Ranch: "We track weights every time we haul out to a different property, as well as anytime we get a chance to understand better when our calves/finishers are gaining weight/losing weight. We do have a portable scale with load cells. It is easy to move and run cattle through and I would recommend a similar setup to anyone for tracking cattle weights." Y'all knew this was coming, right? 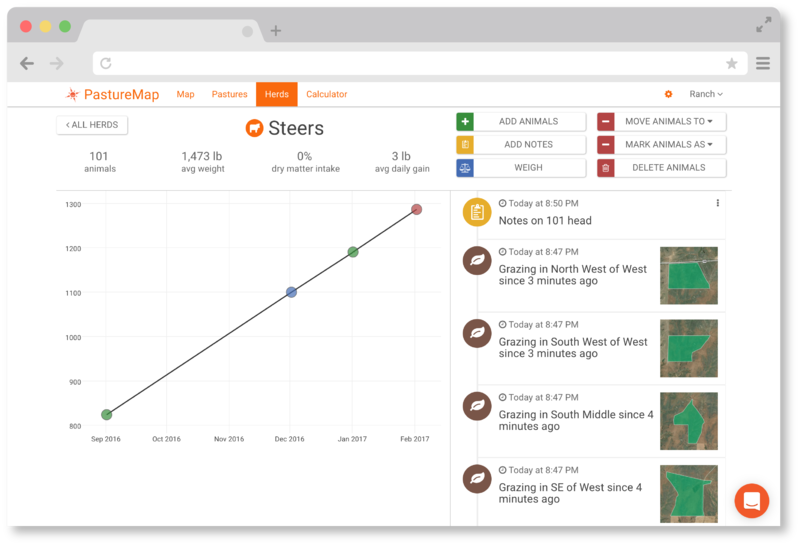 PastureMap has been EID-compatible from Day One, but not a lot of ranchers realize this powerful feature. EID records and individual cattle weight records are easy to integrate into PastureMap. All the leading EID readers on the market come with the ability to export data into a CSV. All you have to do is import that into PastureMap. Compare individual animals to whole herd to see whether they're performing above or below average. Look at the winners / losers by Sire and Dam and make your culls. Get granular with pasture nutrient density. Track a herd's weight performance to individual pastures to see if they're producing the gains and profits you need. How can I make more money using EID cattle records? You don't need to be in a certified program to make more profits using individual cattle records. More granular, individual cattle records can drive better decisions and ROI for both your pastures and herd performance. Make sure your animals are converting grass to dollars. You don't need to be in a certified program to improve your herd individually. Weed out the ones who aren't gaining well on your pastures. Find out early in the season if certain animals aren't going to make your targets. Save your grass bank for better performing critters. Improve nutrition in each pasture to get the gains you want. Portable scales can accurately tie cattle weight gains to specific pastures, allowing you to identify which grazing cell or group of pastures is contributing to your profits. This data will enable you to make decisions to improve forage quality or nutrient density for individual pastures, boosting animal gains. Portable EID scales (e.g. as cattle pass through a gate, or as they come to water) can also fit in well with a low stress cattle stockmanship program. Access new markets. EID records are becoming mandatory for more and more export markets. Asia is a huge growth market for beef. While EIDs are already mandatory in Canada for export markets like China, the American beef industry is still navigating many global trade opportunities. Getting EID implemented on your herd means investing in a value-added competitive edge for export markets. Get paid a premium in certification programs. Japan's source and age verified program continues to pay a premium for EID verified beef. Like it or not, consumers are increasingly demanding transparency and higher standards in beef production. Retailers are following suit. The GAP 5 step animal welfare certification program, currently used by Whole Foods, is getting adopted by more mainstream retailers like Wendy's and others.